When I was 14 years old, I traveled to a small town called Tanneron, in the Midi region of France, to babysit for an American-Belgian family. It was a summer of firsts: first overseas journey, first time alone with children overnight, first anchovy, first deep-fried acacia. I remember inspecting a soft, ripened cheese — first time I’d ever seen cheese in a wooden box — garnished with walnuts. All these experiences made the occasional trials of child care worthwhile. I hardly minded the daily spit-up, though I did change my clothes a lot. Neither did I mind sleeping in the same room with the children, or struggling to pin their diapers, or raising a spoonful of pulverized carrots and cauliflower to their firmly closed mouths only to wipe it from the floor a few minutes later. Of all the lovely, odd, and messy things that I encountered in the South of France, the one that most enchants me still is honey. The father of the children I looked after was an artisanal beekeeper named Peter. His specialty was lavender honey, though he made other varieties, too — chestnut, acacia, and pine. The extracting machinery was located on his parents' farm, a few miles from where we lived. There I witnessed comb-honey extraction, and even got to wade in honey one night when the extractor broke down and the contents of the machine bowl ran onto the extracting-room floor. At the end of my stay, as a reward for moderately successful nannydom, Peter took me on a hive-checking expedition in the back country. I donned a roomy white canvas jumpsuit and rode shotgun in a semi loaded with empty hives, visiting the farmers whose fields Peter’s bees pollinated and switching empty combs for full ones. I handled the smoker as Peter opened the hives, checking to see if the cells were brimming and the broods were healthy. Honey, Peter liked to point out, was one of a very small number of foods that humans could not reproduce in a laboratory. If the bees don’t make it, humans can’t have it. A beekeeper finds satisfaction in that knowledge; it sets him apart from the agricultural crowd. Having so many good memories of honeybees, I was pleased to read that the Obama family has employed a First Beekeeper. This simple act will raise food-systems consciousness in the United States as the planting of an organic vegetable garden already has. Of that fact, I am very glad. Moreover, the older of the Obama children will soon be about the age I was when I traveled to Tanneron. Like me, perhaps, she will not be all that fond of honey when she first peers at supers lining the hives like files in a filing cabinet. She will be afraid of getting stung. She will be overwhelmed by the thousands of bodies moving over and past one another on the frame. But maybe she will like the smell of wax, warm and earthy, rising from the hive. She will marvel at the tiny cups on the workers’ legs, fine hairs catching pollen and turning it into a curious food called "bee bread." She will wonder about workers and drones and queens. I certainly hope she will respect the person who tends these animals, if only because he is brave about bee stings. I don’t cook very much with honey, partly because my pantry is so well-stocked with [/mix/dinnerguest/ofbreadandsyrupinthewisconsinwoods "maple syrup"]. I still long to be a beekeeper, though. Wood and wax and honey are wonderful elements, the stuff of hobbit holes, the sine qua non_ of cozy. Unfortunately, I know too well the lore of foul brood, varroa mites, and colony collapse disorder to harbor romantic fantasies about the pastime. Like any agricultural labor, beekeeping is hard and frequently disappointing work. Peter got out of it in the early 1990s, beaten down by droughts, pests, and fickle markets. 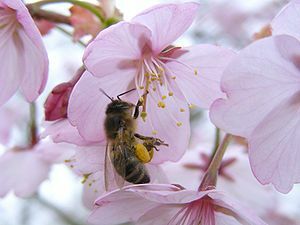 This spring, the First Bees gathered nectar from Washington, D.C.’s vaunted cherry trees for the first time. Emissaries of the presidential gardens, the bees united the nation’s most powerful office with the petal-strewn walks any citizen might wander. None of us swooning in the fragrant pink haze — not the commander-in-chief, not the sensibly shod pedestrian, not even the First Beekeeper — could make of that froth what the honeybees did. Now, the bees are bracing themselves for winter. They are likely gathered in a ball, slowly beating their wings to generate heat. Many will die by next year’s cherry blossoming, dropping from the ball one by one. But the queen and a few nanny-bees will survive to nurture larvae enough to send another team of workers to the flowers. 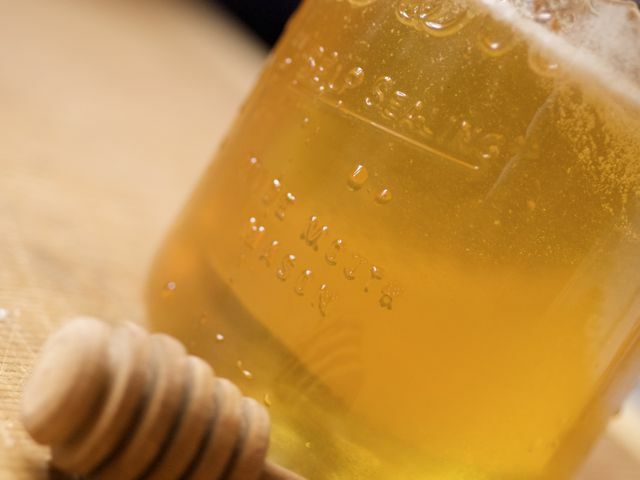 Those of us who love honey take comfort in the symbol and substance of that.